1/2"oriented strand board and Air Barrier. 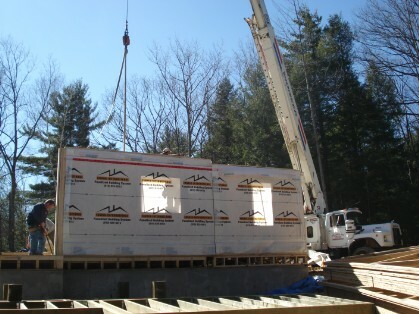 The walls can be shipped in sections of 8' long to 50' long when a 3 men crew and a crane is available. The walls are numbered for easy assembly. The interior partitions are made from 2"x4" - 16” c/c with 1"x3" ribbon on the centre. (can be made in 2"x6" if required). Isulated walls can be made if requested. 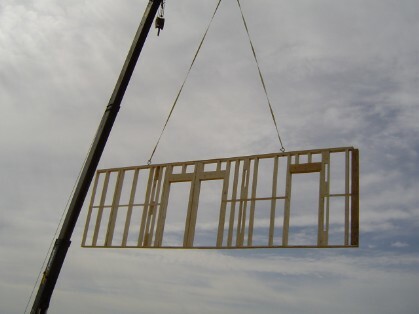 Some 2"x4" and 2"x6" lumber are provided for bracing.